Are you planning a construction or demolition project either in your own home or as part of a commercial venture? Then, you will need to rent a dumpster. Be cautious as the Cheap Dumpster may not end up being cheap. You need to beware of dumpster brokers and the additional fees or hidden charges that may apply. With Dumpster4u.com, you will receive upfront pricing. You simply pay the price we quote you. No back end charges, ever! The top of our 10 yard dumpster is only 4 feet high. This allows for easy loading from either side or from the full, rear swing door. Our 20 yard dumpster is shorter than most other dumpster companies. This allows us to navigate it in smaller areas where you can make full use of the rear swing door so you can fill the dumpster quickly and with ease. Make sure there is enough space to deliver the roll-off dumpster. Take the size of your driveway into account when choosing your roll-off dumpster. While you need the proper space to deal with your debris, you also have to take into consideration the correct area to park and store the dumpster for the entirety of the project, as well. Obviously in the interest of space, hassle, and money, you want to rent a dumpster that is appropriate for your project. 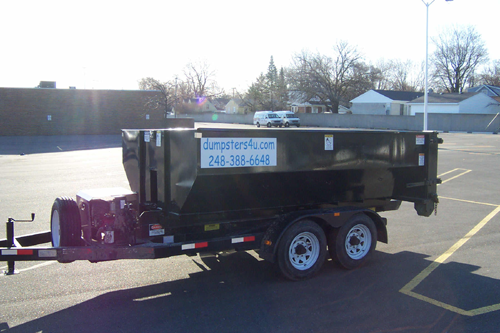 We prefer our customers call us to determine the correct size of the dumpster you need for your project. You can also visit our Dumpster Size page to get an idea of how much and what our dumpsters will hold. We leave the port-o-potties, snow plowing, gutter cleaning to the the other 'Dumpster Companies," all we do are dumpsters, and, we do it really well! Would you like a dumpster quote? Click Here! If you would to contact us, Click Here!